A man has been given the shock of his life after he purchased a brand new iPhone X only to discover it has android features. 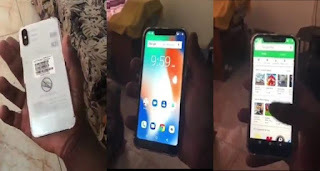 A Nigerian man has cried out for help after after finding out that the brand new iPhone X he purchased came with android features - which showed that it was not authentic. The man who shared the story on Instagram found out while inspecting the phone with his friend. They discovered that the new iPhone had the android home button and even had the play store app amongst other android applications .